Partly cloudy early followed by cloudy skies overnight. Low 44F. Winds W at 5 to 10 mph. The wife of former legislator Arlie DeJarnatt cared deeply about social injustice and helping her community. “You can’t fix the whole world, but you can improve your corner” was a favorite saying of Donna’s, according her daughter Judy Fardig, 59, of Portland. In addition to social causes, art was a life-long love of DeJarnatt’s. She was a founding member of the Broadway Gallery in Longview and eventually blossomed into a full-time artist. Donna DeJarnatt died July 27 of Alzheimer’s disease. She was 83 years old. A memorial service is scheduled for Aug. 30 at 1:30 p.m. at Lower Columbia College’s Rose Center. Daughter Lise DeJarnatt Husted, 50, of Shoreline, Wash., said her mother will be missed for her optimism. Her trademark friendliness is what caught her husband’s eye when they both attended Oberlin College in the 1940s. “She always smiled and said ‘hi’ to everyone on campus — that’s how she met my dad,” who was quite shy, Husted said. 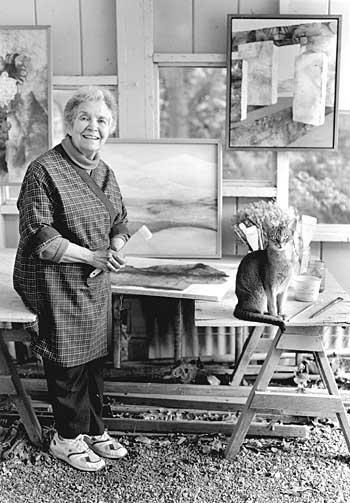 Donna DeJarnatt graduated with a fine arts degree in 1946 and taught art at Cornell College in Iowa during the early years of her marriage. Donna and Arlie moved to Longview in 1953. Her husband taught social studies at Monticello Middle School and then civics at R.A. Long High School. In the 1960s, he made his first run for the Legislature. Donna organized his political campaign at a time when it was uncommon for women to be politically active, Fardig said. DeJarnatt also worked as a educator. She taught fifth grade at St. Helens Elementary School and art classes at Monticello Middle School in Longview for a 10 years in the 1960s and 70s. Former students, now in their 40s and 50s, were known to stop by the Broadway Gallery in later years just to see DeJarnatt, fellow artist Susy Halverson said. DeJarnatt made the gallery into a relaxed meeting place for artists, she said. Donna DeJarnatt was born 1924 in Denver to a portrait photographer father and mother who colored the portraits. “Sand paintings,” in which an artist incorporates sand into patterns on a canvas, collages and watercolors were DeJarnatt’s favorite to create. “It gave her some freedom and allowed her to be an artist instead of just a mom and politician’s wife,” Husted said. DeJarnatt was an avid reader and highly valued education, serving on the Lower Columbia College Board of Trustees from 1994 to 2002. When her children were growing up, DeJarnatt would encourage them to explore the outdoors. Fardig remembers one time her mother even helped her children build cages for little snakes her children caught. “I never knew of anyone who would let children bring snakes in the house, let alone build a cage,” Fardig said. But when it came to learning, her mother was “never satisfied to just give the simplest answer. She really wanted us to learn,” she said. Politics were a common topic at the DeJarnatt’s dinner table, Fardig said. Both her parents were ardent Democrats, Fardig said, and her mother remained active in the local party chapter through most of her adult life. Despite her strong beliefs, Donna wasn’t one to take center stage. Even at her husband’s funeral in 1990, DeJarnatt devoted her attention to those around her.